Wondering whether your child is ready for one nap a day? Learn when to drop that second nap plus get essential tips to make that transition to one nap. Did you notice back in the newborn days we never bothered to count naps? It seemed like we were trying to get our babies to nap so often we lost count. But as they grew up, we began to see patterns emerge. We created schedules and routines. We may have started off with four daily naps, then it became three and finally two. And just as we had been holding steady at two, our toddlers began to show signs to transition to one nap. This one nap schedule will be the one they’ll have—if you’re lucky—all through their preschool years. 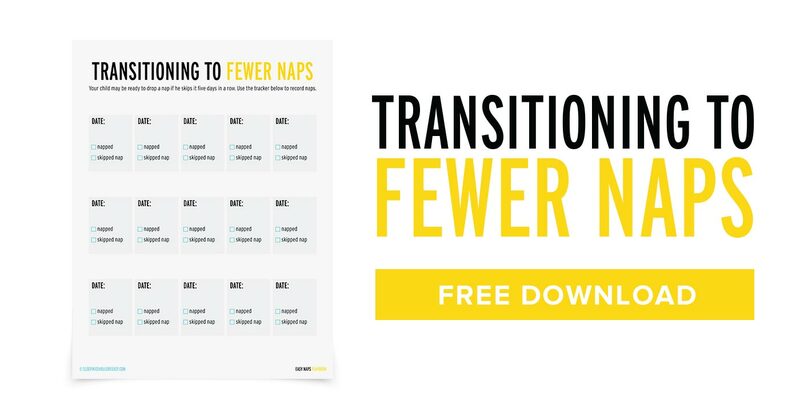 So, how can we make that transition smooth and establish good napping habits? My three-year-old twins have been taking one long, mid-day nap since they were about a year and a half old. While the dwindling number of naps might seem like less opportunities to catch a break, I enjoy the long stretch of uninterrupted time. I also love how we can plan longer outings for the morning or afternoon with just one nap to schedule our days around. Every child has different sleep needs. While most toddlers tend to drop to one nap around 14-18 months old, this doesn’t mean your child has to follow suit. Making the transition to one nap is much smoother when you do so gradually. So don’t just go from two naps one day and one nap the next. Instead, move sleep times around by 15 minutes at first. If you think you child can hang with it, try for 30 minute increments, but aim for a more gradual transition at first. So, how does this look like for a typical day? Let’s say your toddler naps from 10-11am in the morning, but you’d like to establish one long, two-hour nap from 12-2pm. On the first day, move his first nap to 10:15am. Keep him at this schedule for two to three days before pushing it further to 10:30am. And keep moving this back until you finally hit 12pm. After you begin to push back his morning naps, allow your toddler to sleep in. Let’s say he naps for an hour. Don’t wake him up an hour from when he naps and instead allow him to sleep in as long as possible. This might disrupt the afternoon nap, but you’re helping him stretch one morning nap into one long afternoon one. With your toddler sleeping in for that morning nap, he might need a quick cat nap in the afternoon. Base the time you put him to nap on his behavior. If he feels grumpy or sleepy, let him sleep for 30 minutes in the late afternoon. Time it well so the cat nap isn’t too close to bedtime, either. Wake him up if need be so he has enough awake time before bedtime. The goal is to drop this cat nap, especially as you continue to lengthen and push his morning one later in the day. At some point, your toddler’s morning nap will move later in the day that it doesn’t make sense to put him down for a second cat nap. But at the same time, he might begin to feel sleepy long before his regular bedtime. To accommodate his new schedule and need for sleep, experiment with moving his bedtime earlier, even if just temporarily. If he falls asleep by 7pm, see if you can move bedtime earlier to 6:30pm. He might feel sleepy just taking one nap for the day, and the earlier bedtime can help make up for the lost hours. Take a look at several examples of a 1 year old nap schedule. Change is hard on everybody, both parents and kids. 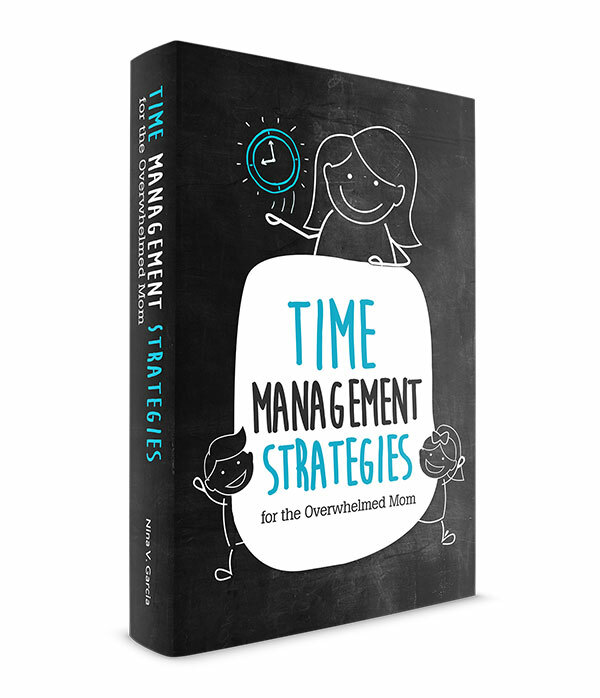 You’ll likely find yourself with a grumpy child struggling with the lack of sleep as he makes this transition. Move to one nap when you know there isn’t much else going on in his day. Don’t start on the weekend you know you’ll be out and about with lots of action. You might end up with a crabby child on your hands. And when he does act up and fuss, keep in mind that he’s likely doing so because he’s adjusting to a new schedule. Prepare yourself to be as patient as you can while he moves to one nap. Making the transition to one nap is a bittersweet moment. We’re letting go of the baby stage as our little ones grow into the toddlers and eventually preschoolers they’ll become. But switching to one nap is also a convenience many parents welcome. We can be out and about more with just one nap to contend with. And we get a longer stretch of time alone instead of broken into smaller chunks. Long gone are those days when our babies napped so often we lost count. Now we just have one long, mid-day nap, just what our toddlers need. 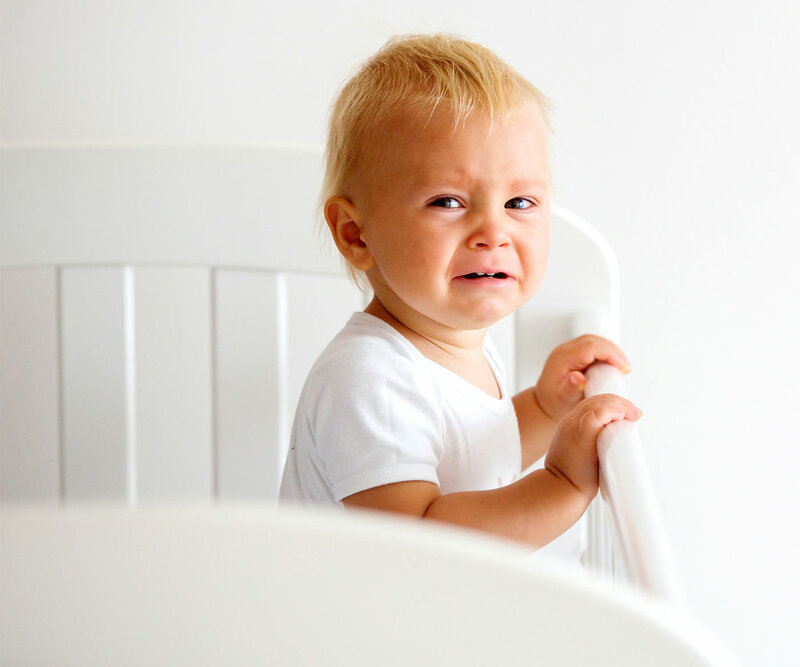 Does your child wake up cranky and screaming from naps? 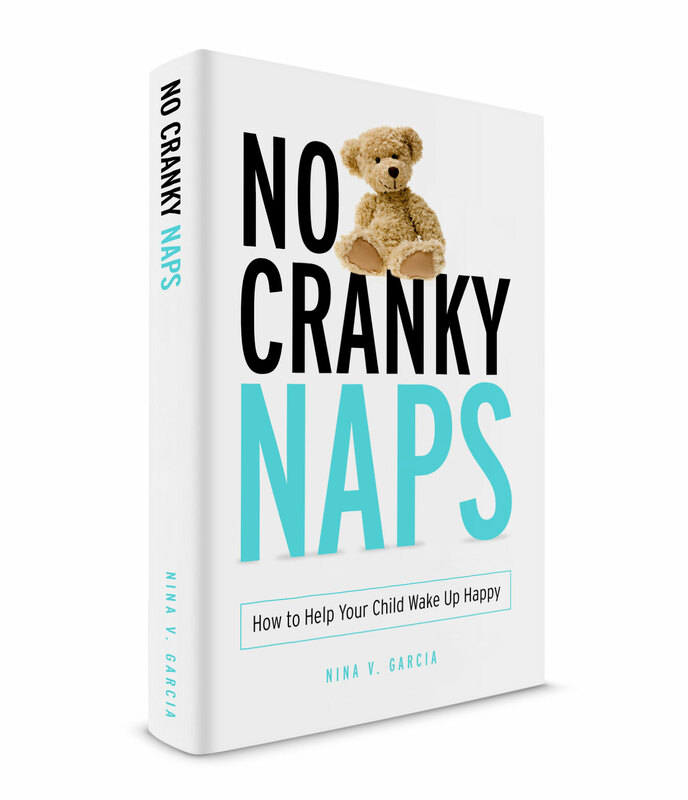 Learn how to help him wake up happier with my ebook, No Cranky Naps! Uncover the reasons he wakes up cranky, and learn how to equip him with the tools to cope with his big feelings. Get No Cranky Naps right here. Did you like this article about how to transition to one nap? Share it on Pinterest and Facebook! Hi! When you put your a child down for a late afternoon nap, what time should that start/end? Should it be 3 hrs after they wake from their first nap? Should you push bedtime back a little later if they take a short afternoon nap? Hi Melissa! The afternoon nap can start or end depending on many factors, from what time they woke up from the first nap, to when bedtime is, to how long they’ve napped, etc. Usually you do want to allow enough awake time between the time they woke up from the nap to bedtime, so that they can still sleep comfortably at night. As far as pushing bedtime back, it all depends on how well your child sleeps with the amount of awake time they had during that time. Usually a short afternoon nap is for those times when the one nap is too far away from bedtime, and the short nap offers a quick refresher before bedtime, so I wouldn’t push bedtime back for that purpose, but rather wake your child up and keep the nap short. Our daycare is moving our daughter to the toddler room at 12 months and gave me their schedule and it states only 1 nap at 1pm. My daughter is currently taking 2-3 naps a day still. Is there any guidance or pediatric recommendations out there on when to change to 1 nap? I don’t feel like she is developmentally ready for 1. Hi Jenna! I hear you—it’s tough when daycares have kids move to a new schedule when they’re not ready for it yet. See if the daycare is willing or flexible to work with your baby’s needs, like giving her an extra cat nap or letting her sleep longer than their schedule. If they can’t, then adjust what you need to adjust for the remainder of the day, like making bedtime earlier or letting her sleep later in the mornings. I’m working with my 17 month old to transition to 1 nap, as he has been frequently refusing either the morning or afternoon nap for some time now. On other days, however, he sleeps well (1-2 hours) for both. Is there anything ‘wrong’ with alternating days of 2 naps and then 1 nap, depending on what we are doing that day (I’m a stay at home mom) and what time he wakes in the morning? There is not much predictability in this routine at the moment is my only concern, for both of us. He is currently going to bed between 6:30 and 7:30pm (depending on how the day’s naps went) and waking 11.5 to 12.5 hours later, so he is generally getting plenty of sleep at night. He starts 2 days/week of halfday daycare next week, so on those days he will up be awake until I pick him up at 1! I don’t think anything seriously bad will happen if you alternate, like if he wakes up late in the morning, then yes it makes sense to do one nap since fitting in two might be too hard. And of course there are days when naps fit around your schedule instead of the other way around (for instance, if you have a play date, then it’s okay to switch your naps around to make it happen). That said, it does help to be as consistent as possible all other times. If your day allows it and he wakes up regularly, see if he takes those two naps. Over time, he’ll likely be consistently skipping one of them, at which point it’ll be pretty clear that he’s ready to go down to one nap. Hello!! My baby is 15 months. She was sleeping 2 naps, one from 1015 to 1130 and the other from 230 to 330pm and goes to bed around 7 and 715pm. She was sleeping until 630/7am in the morning. For 2 weeks from now she was skipping naps (sometimes in teh morning she didint fell sleep until 11am or sometimes in teh afternoon she stays the whole hour in her crib but not sleep). In the weekends we go our beach house and there she was leeping only 1 nap fom 1 to 230pm. Hello! We have been transitioning our 16 mo old from two 45 min naps (10am and 3pm) to one longer for the last few days, since she has started taking much longer to go down for the second nap, cutting it close to her 7pm bedtime, or refusing it. I am having trouble keeping her down for longer than 45 minutes, so now her morning nap is late but short– 11am, for about 45 min still, and she’s not tired enough for a second. Is she just not ready yet? Should we just keep pushing it later, regardless of how long she sleeps? She’s been waking super early, will putting her down early make her wake even earlier? She’s likely going to resist the second nap with an 11am nap more so than the 10am one since she’s waking up at 11:45 instead of 10:45 like before. If she’s still taking only 45 minutes to nap even at 11am, see what happens if you move the nap mid-day to something like 12pm to try to get her nap longer. Another option, especially since you said she’s waking up early, is to nap at 11am, and if she only takes a short nap, move bedtime earlier so she can make up for lost sleep. Ideally you want her napping for a long stretch in the middle of the day. 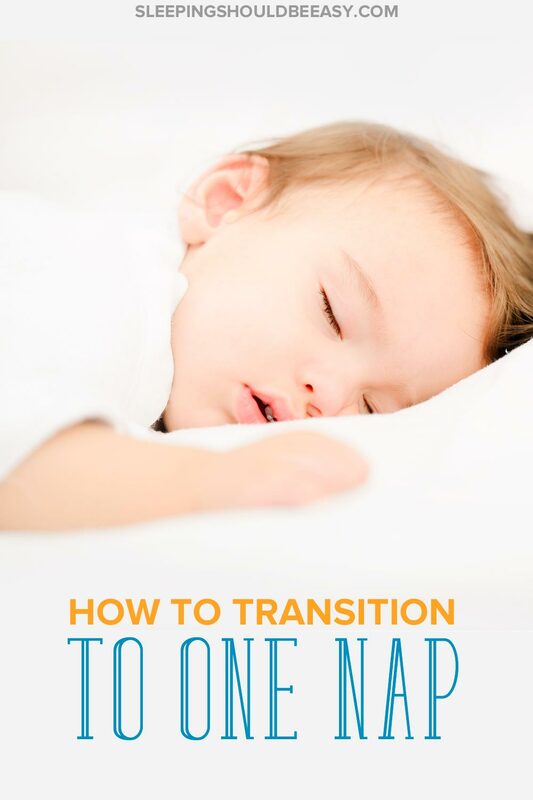 This transition can be tricky and be filled with lots of crankiness, so hang tight and harness all your patience 😉 Keep experimenting with nap times and bedtime until you find the right one. My daughter is 14months old. For 4 weeks or so, she has been really struggling at bed time taking an hour or more for me to get her down. Was thinking it was regression or teething, etc. But it’s been several weeks now. Her nap times aren’t affected typically. She sleeps mostly through the night…. mostly lol. We are on a 2, 3, 4 hour sleep routine. But bedtime has been super difficult. Time to transition to 1 nap even though her nap times seem normal? She typically wakes around 7, down for nap by 2 hours, around 9am, and sleeps for about an hour or hour and a half. Then up for 3 hours with nap around 2 ish. Then up for 4 hour and down for bed (or attempt) to be asleep around the 4 hour mark which is typically around 7:30. I’ve even tried extending that 4 hours to 5, and she still fights me. TIA!! Hi Jennifer! You could definitely try going down to one nap, since toddlers tend to drop to that one nap a day schedule around 14-18 months old. You can also try to flip it where she has less awake time toward the end of the day, and more awake time in the morning. We get progressively worse in general as the day progresses, and she just might not have enough stamina by that point, leading to being overtired come bedtime. I actually tried dropping a nap yesterday and it didn’t go well. I moved her morning nap to noon (she slept for 1.5 hours) and dropped the 2nd one. Offered down time with nursing and calm late in the day so she could doze if she wanted to but she didn’t and then down for bed at 8 (she had woken up for the day at 8am, but now I think I should have pushed bedtime up to 7 or 7:30) anywho, she obviously went right down bc she was super tired but them woke back up 30 minutes in, fell right back to sleep on her own for another 45. I went in and got her right back down. Uncharacteristically, she woke up at 2:30 am and then up for the day at 7. For sure signs of overtiredness and that she’s not ready to drop the nap yet right? My 13 month old went on a second nap strike, she went 11 days of just one 1.5 hour nap and then two days of 2 1+ naps and was semi easy to put down but now she’s back to just fighting her naps and it’s so heartbreaking l. She cries as soon as we go up to start her nap routine (diaper change, book, song, lay down) and I start her white noise about 15-20 mins before her nap. She is so tired in the mornings for the long stretch (4.5 hours) until her nap but fine in the afternoon. If I do an early nap (3 hours after wake up) then I can’t get her to nap in the afternoon and she is then awake for 6-7 hours. Also, now that she is typically taking one nap she falls asleep nursing before bed almost every night and doesn’t get to her book/song, even with an early bedtime – asleep by 6 pm!. She still is sleeping 11-12 hours at night which is good but I am so confused on what to do! Keep trying for 2 naps (I know she is young) or try sticking with 1?! Any suggestions would be greatly appreciated! Thank you! Hi Katie! Try sticking to two naps for a few more weeks and see how she does. Maybe instead of having 3 hours of awake time before that first nap, see what happens if you put her down at 2.5 hours of awake time. Then, make sure she also has plenty of awake time between the first and second naps, even if it means waking her up from that first nap. And finally, try pushing that second nap later if need be, so that she also has more awake time between naps 1 and 2, push back bedtime as well if need be, and wake her up from nap 2 if it’s going on too long. Ok thank you! The issue I’ve been running into is thay she will go down fairly easy for her morning nap and sleep 1-1.5 hours, the last two days I’ve woken her after an hour (1030ish) and then tried a nap 3.5-4hours later and she just lays/talks/fusses in her crib for half an hour and doesn’t sleep so then she’s up from 1030-6 and passes out nursing within a couple minutes! She’s very happy and content after staying up that long just so tired once it gets to her bedtime routine … some days she will give in and take that afternoon nap but it’s probably been 4x in the last 2.5 weeks!